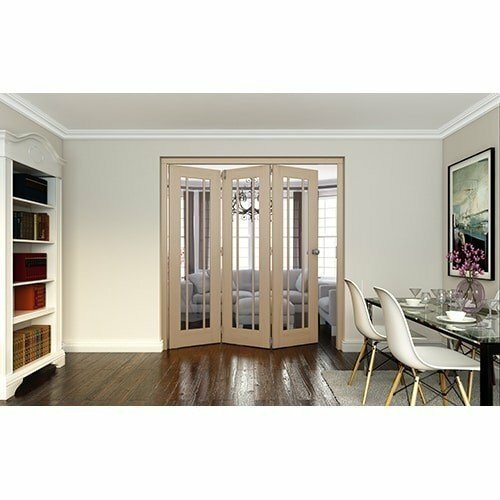 The JELD-WEN 2 door Worcester white oak clear glazed roomfold doorset is a stylish, high quality folding door system that provides the option of turning two rooms into one. It is top hung with high quality brushed stainless steel hardware and no bottom track, meaning quicker installation and uninterrupted flooring from room to room. Supplied with an oak hardwood frame ready for site decoration. Ready for installation with a frame pack, hardware pack and door pack. Watch the video’s for more information and to get a glimse of how the JELD-WEN roomfold doors function. It is essential that the JELD-WEN 2 door Worcester white oak clear glazed roomfold doorset frame and door’s are completely finished on the two faces and all FOUR edges plus any cut-outs for locks, handles and hinges etc. Prior to finishing or sealing, lightly sand any handling marks. Do not use wire wool or other sanding materials containing steel or iron on our doors. Interior doors may be finished using a proprietary branded stain, paint, clear varnish or clear lacquer. Our doors are NOT suitable for waxes, polishes, dyes or oils (including Osmo UV oil) as they do not properly seal the door and can lead to delamination of the veneer.Failure to seal the doors accordingly will invalidate any claims.